The Ford Fusion continues to be a top-selling mid-size sedan, and with good reasons. Not only is it eco-friendly, it offers impressive tech features emphasizing comfort, fuel efficiency and ease of use. We here at M & M Ford Lincoln find it hard to decide which Fusion tech features we love most. Here are two that gets us excited. Brake Coach overlay is a configurable screen within the cluster that displays after you bring the Fusion to a stop. It coaches you to brake in a way that returns the most amount of energy to the regenerative braking system. A percentage on the screen indicates the amount of your regenerative braking efficiency. Over time, your braking technique improves to return the most energy to the braking system. The overlay can be disabled through the settings menu if you choose not to use it. 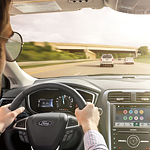 With FordPass Connect, you enjoy an in-cabin Wi-Fi network boasting a 50-foot range. The network supports 10 devices, delivering AT&T-powered 4G LTE speeds. See the Fusion up close and personal today. Visit our Ford showroom for a test drive.